The Selle Italia Novus Flow is a firm saddle that's proved comfortable for many miles over some unforgiving terrain. Its smooth surface lets you move around easily and it's easy to clean if things get a little mucky. With deep wings narrowing to a curvaceous nose, the saddle has a distinctive shape. It's available in two sizes, S and L, our L coming in long and slender at 146 x 278mm, with an airflow channel in the middle. This enables the saddle to flex on the springy side panels without causing pressure on your most sensitive area. It's very comfortable, with the sleek, flowing shape letting you find just the right position. Reinforced 'corners' on the sides help protect against damage, with carbon inserts to keep the weight down - well, it would defeat the object if your comfortable seat weighed a ton. The Novus Flow comes in at 225g so no worries on that score. To complete the weight-saving setup, the 7mm rails are made from titanium Ti316, with guide markings on them to help you get that important position dialled in. Looking at the saddle side on you see something akin to a supersonic aircraft, built for speed and very aerodynamic. The Fibra-tec material of the cover provides a smooth top but nothing that causes you to slide around - you can move about without feeling as if you are going to slip off the back. The Selle Italia Novus Flow combines striking looks with enough flex that long rides won't turn into nightmares. You can sit on it comfortably for hours safe in the knowledge that when you get off the bike you won't be walking like a cowboy. Having found a brand and model I'm comfortable on, I was slightly sceptical at trying another. 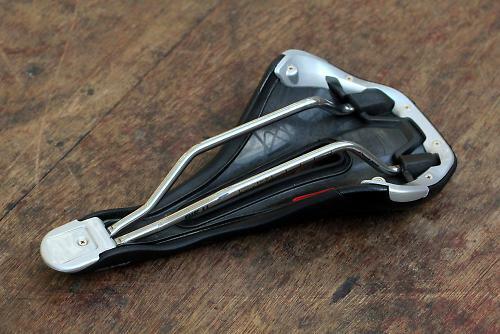 However, the Selle Italia Novus Flow was something of a revelation. A good size, offering a degree of flexibility, firm without compromising comfort. Selle Italia say: "A reborn saddle from the nineties reappears in a brand new version. IDmatch re-defines the market positioning of the earlier special edition with Ferrari engineering. The saddle is shaped to help the rider move forward in order to achieve an optimum riding position with more effective power transition output." The Fibra-Tec covering is easy to clean, and the main body has a flex to the wings which helps generate a position that is ideal for long rides without compromising comfort. I found the saddle good for short and longer rides. There has been no discernible sign of wear and tear despite many weeks of use in all conditions. Perhaps not the lightest saddle on the market but by no means something you'll notice once it's attached to your bike. Every rider has an intimate knowledge of what type of saddle they find suitable. The flex in the saddle wings meant I could sit comfortably on rides of any duration. You are paying a premium price, and despite the qualities of the Selle Italia Novus Flow there are other brands out there offering comparable products at cheaper prices. More than meets the requirements you would expect, apart from the price. A firmness to the ride but with enough flex to allow movement and provide comfort. The price will put some off. A saddle that offers enough flex to remove the harshness from the road and provide comfort on any duration of ride, but it is pricey.